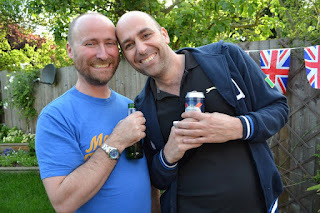 Last Monday - the first Queen's Diamond Jubilee Bank Holiday - Johnnie had his birthday party down at his and Jeremy's home in South Norwood. It was a sort of joint birthday / Jubille bash - we attended to help both the two old Queens celebrate at once. They have a lovely home, a great garden and everyone had a great time. 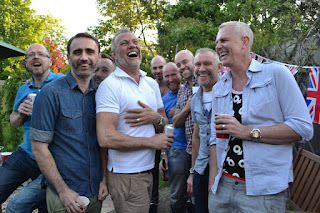 There was much laughing and mucking about. We even raided the fridge in a frenzy.